Update 6/1/17: Congratulation buildOn Trek alum Scott Flanary on winning Season 29 of The Amazing Race! Not only is Scott Flanary a contestant on this season of The Amazing Race on CBS, he is also an avid member of the buildOn movement. Through his work with buildOn partner Moss Adams, Scott has been on two Treks to build schools with buildOn—first to Nicaragua in 2014 and again to Malawi in 2015. And The Amazing Race won’t be the end of Scott’s travels in 2017. Scott is also planning on going on a third Trek to build a school in Senegal later this year! 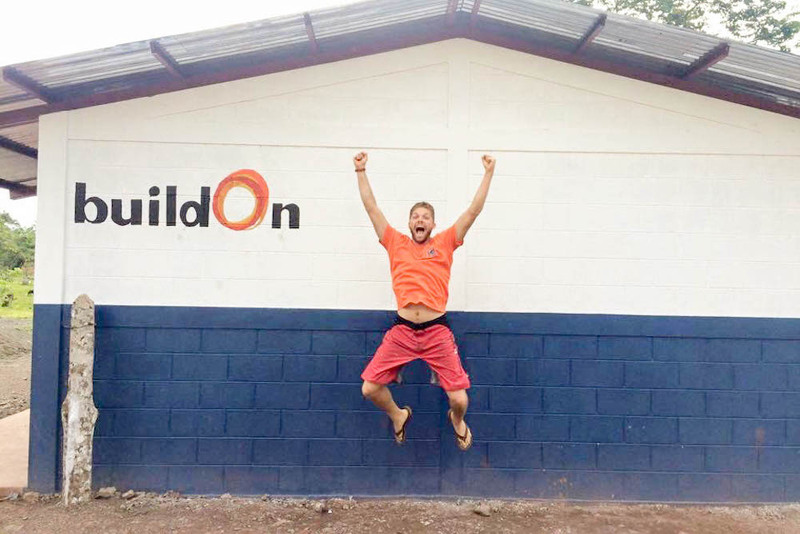 The buildOn Trek program brings groups of volunteers from across the globe to some of economically poorest countries in the world to work in partnership with local community members to build schools. 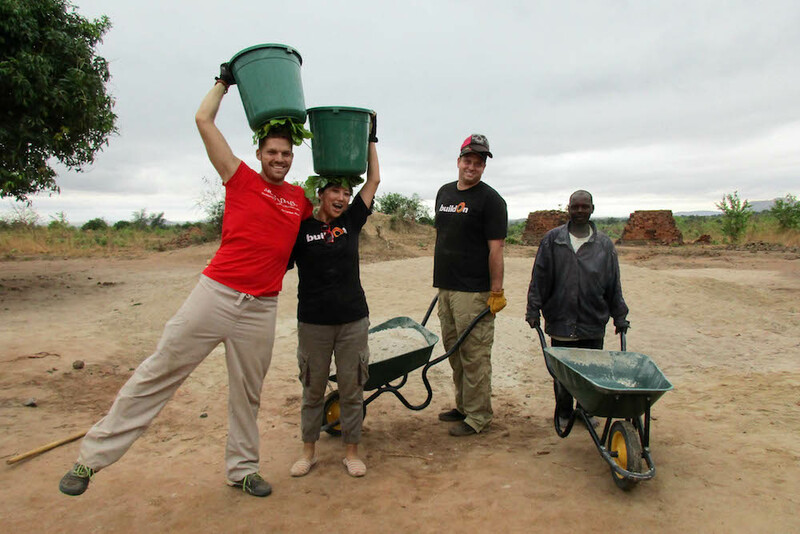 buildOn recently sat down with Scott to discuss his experiences on Trek and The Amazing Race. Above: Scott Flanary (left) poses for a picture on the worksite in Malawi with coworkers from Moss Adams and a community member. What inspired you to go on Trek with buildOn to build a school in a developing country? I have always valued education. My parents instilled in me the importance of education from a young age, and I loved it so much that even when I finished my personal education, I went back and earned my Masters degree in Education Administration. And I started my career in higher education before I started working at Moss Adams, where I am now, and where I still get to work with college students. And so, this innate passion for education kind of bleeds over into how I want to give back to the greater community. And when I found out about buildOn and how you specifically build a school on Trek, I thought, “Oh my gosh, this is 100% in line with what I feel like I’m on this earth to do—to promote education.” And so when I found out about this opportunity through Moss Adams, and that a group of Moss Adams individuals gets together each year to go on Trek and build a school, it just seemed like everything just kind of fell into place. Did your experiences on Trek help to prepare you for The Amazing Race in any way? I fully believe Trek was one of the things from my past that prepared me the most for The Amazing Race. Obviously, I went on Trek for other reasons—I wanted to give back. I wanted to make this contribution. But because of Trek I did get to experience what it is like to travel internationally, what it was like to live with a host family and to submerge myself into a culture that’s not my own. I learned what it’s like to travel through a country, because after both of those Treks, I took some time to stay in the country and learn more about living there and experiencing what’s happening. When I went on the race, it was interesting because a lot of my fellow castmates had not left the country before, and I was in their shoes just a few years prior when I had never been on Trek. You think about Mexico and Canada, or maybe a Caribbean island and, yes, technically, those are international destinations, but to actually leave the continent—I had that experience on Trek. And it’s a whole different experience to know, okay, when you travel internationally the flights are like this, and when you get off the plane, the signs are not in English, and you need to be respectful of the customs here, and you think about these internal checklists that if you didn’t already have international travel experience, it doesn’t come as second nature to you. Above: A fan of The Amazing Race from the very first season in 2001, Scott is now a contestant on season 29. Are there any other ways that you feel like Trek helped to shape your perspective going into the show or helped you to overcome any challenges on The Amazing Race? Oh gosh, so many. I hope I can articulate them. Learning a little bit of the language, like we did on Trek, was a major help. Before the Treks I went on, we had an orientation where we learn a couple of phrases or some words in the local language. I am terrible at pronunciation of different languages, it’s not a skill set I possess, and I think I actually say that in my biography on CBS. I am just not a foreign language person. But I give it my all, and I try, and on Trek the community members would laugh and they would love the attempt. And then we would resort to sign language to get our point across. I think that also served me very well on the race, because I would learn basic words and phrases, again through flight attendants, or we could use computers in the airports, and I would write words down, and I would try to speak it to the cabdriver or to the person running the challenge and it was the same thing—there was laughter because I’m butchering it, but they see I’m trying, and we resort back to sign language. And so, to know that was the process I had to go through to communicate with someone who doesn’t speak English, I was ready for that. So none of that came as a shock to me because of Trek. Thinking back to the two Treks that you’ve been on, what has been most meaningful to you about the Trek experience? What struck me the most throughout the experiences is the openness and the willingness for communities to open their arms and welcome us into their community. For a community who has no idea who we are and who might have preconceived notions about what Americans are like, they were so welcoming and appreciative. Not only did they allow us into the community, but they set us up—we lived with them, we ate with them, they taught us about their culture. That’s how they thanked us for helping to build the school. What struck me the most throughout the experiences is the openness and the willingness for communities to open their arms and welcome us into their community. There is giving in both directions—we gave the financial support to build the school, the materials and some of the labor, and they gave to us by hosting us in their homes and letting us to understand who they are and to take that different perspective of the world back with us. I think it’s just … it’s a trade of goods that you’re never going to get anywhere else. Have the two Treks that you’ve been on changed your perspective in any way or influenced how you see the world? Absolutely. When I went on Trek to Malawi, I just saw everyone in that community interact with each other within the village. It was like all hands on deck—mothers looked after each other’s children so they help build on the worksite, all the guys hung out at night to put in extra work on the school. That just really shifted my perspective in how I should go back to my community, back here in the States. Living in a metropolis like Los Angeles, it’s super easy to get into your routine and think about “me” rather than think about the “we.” And I made it a point on Trek to Malawi to say I need to remember this feeling that I’m having right now, because I don’t want this feeling to go for naught. I want to really change how I’m participating in my community, and how I’m interacting with others, and how I’ve realized that love can be for the sake of all and not just romantic for your partner and familial with your family. And so I think that was the biggest thing I took away, because I do put down my phone when I’m in public as much as possible. I do try to go to parties where I meet new people and really engage them in conversation that’s not just surface level. And I’ve tried to be a better friend to my friends. Really listening when we speak. I took all of that away from Trek. 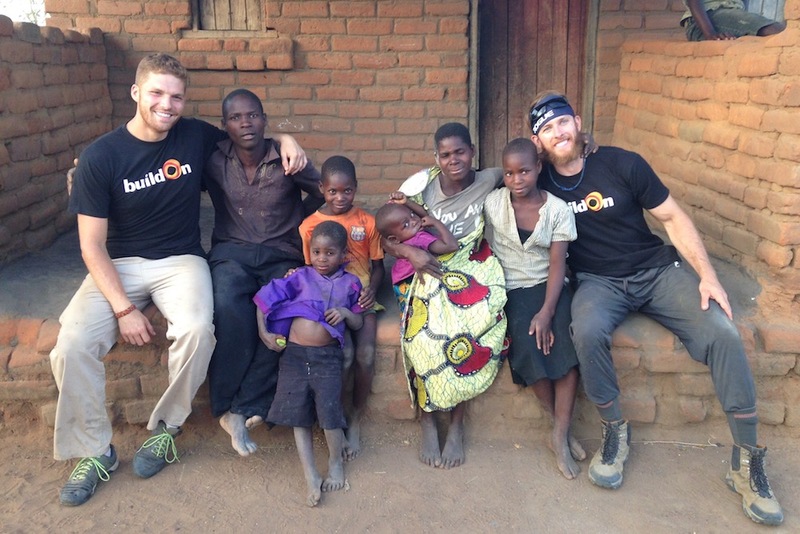 Above: Scott (left) poses for a picture with his host family in Malawi while on Trek with buildOn. What do you hope the schools that you helped to build do for their communities? I know that the communities were so, so grateful to have a school, and they loved the experience of building the schools. I hope they keep that flame going within their hearts. I hope they say, in five years or ten years down the road, that school was built because we wanted to further education within our village, we wanted to break the cycle of poverty, illiteracy and low expectations, because in doing so, we become a more self-fulfilling village. We all become more successful through education. I know the schools will continue to pay dividends for the communities now and in the future. You’re going on the Moss Adams Trek to Senegal in 2017 with buildOn. What’s the thing that keeps you going back on more Treks? I want to build another school, because one school impacts hundreds and hundreds of people, even those who have yet to be born. I like to be reminded of the experiences I’ve already had. I want that reminder about the sense of community and to be able to give back in an area that I feel very passionate about. I want to build another school, because one school impacts hundreds and hundreds of people, even those who have yet to be born. So it’s just knowing that my hand helped to build three schools as opposed to one or two, I’m reaching more people and it’s very self-fulfilling. Is there any advice that you would give to other people who are considering going on Trek? I would say if they are like me, it’s very nerve-wracking to even think about living without electricity and running water and the comforts of home for up to a week or so. And there’s also this fear of the unknown, if you’ve never participated in an experience like this, it can be nerve-wracking. And if you can understand that everyone feels that way, and yet everyone leaves thinking the experience was not only worth it but beyond their expectations in what they got out of it—if you can manage that emotion, you’ll be glad that you made the step into building the school with buildOn. You talked about the fear of stepping into the unknown and that being a challenge—did you feel any of those same emotions as you prepared for The Amazing Race? Totally, there was … wow, that is so on the nose. It’s the exact same fear. When I got the call that I was cast. Even though this was a 16-year dream come true. Ever since 2001, when the first episode aired, I have always wanted to go, so you think, well, I’ve mentally wanted this, so it’s going to be a super easy transition. No, no. When you get the call that you’re leaving in 3-4 weeks, and then you actually think about that. I could be racing completely around the world in a span of 3 weeks. I don’t know who I’m going to meet. Who I’m going to be paired up with this season, you know, it’s a twist. So I don’t have the comfort of a partner that I already have a relationship with. And I have no idea what challenges I’m going to be presented. You know, I say over and over in my bios that I have a huge fear of heights, and I know The Amazing Race. Heights challenges are always there. And it’s funny, you watch on your couch, and you’re like, why are they upset? They knew they had a heights challenge. But the fear is still a reality for you in the moment. But I was able to tell myself that I had done buildOn. I didn’t know what the challenges on the show were going to be, but I told myself that I had done something similar before, and that I loved it so much that I did Trek again. So I put the nerves to the side, and I was able to live this dream that I’ve been wanting for so long. Watch Scott compete on The Amazing Race tonight on CBS (check your local listing). To learn how you and your coworkers and friends can help build a school like Scott, click HERE.